I have been messing about with fiber of one sort or another since I was very little and that hasn’t changed as I have gotten older. 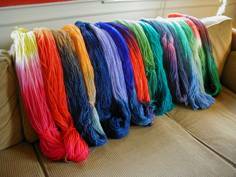 There are more opportunities to try different fiber arts now—the difficulty is that there isn’t as much time to indulge now! We used to have quite a few sheep and more sheep means more fleeces. 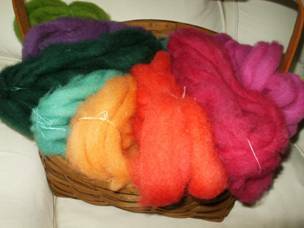 I have “several” boxes of fleece up in the barn waiting to be spun and/or dyed. 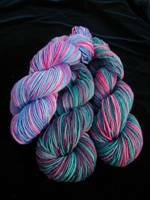 One way to diminish the supply and indulge my love of working with color was to dye what I called “colortails”. 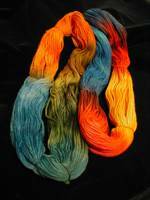 These were one ounce lengths of roving that were dyed any color that suited my fancy on a given “dye day”. 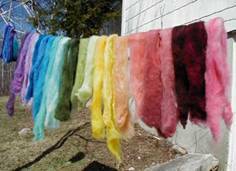 Most of the “colortails” were dyed white wool which produced the clearest colors, but the overdyeing colored fleece created some wonderful heathers for a nice variation. 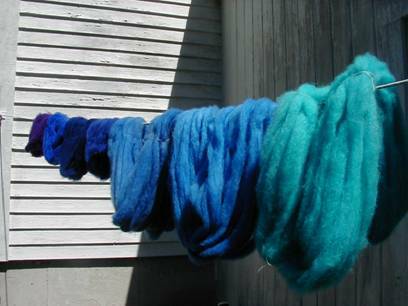 I dye a full range of solid colors for use in my color blending workshops but what I enjoy most is pan-dyeing a variety of wool roving to achieve blended colors for spinning, felting and locker hooking. 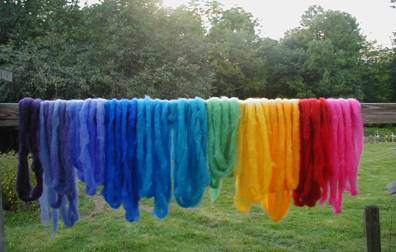 Mostly I do these on my own because the day is just too beautiful not to have colorful wool hanging in the breeze on the back porch. Sometimes several friends come over and we have fun experimenting with color. Check out the calendar. Come visit at the events, or contact me if you like to “talk color and fiber”.